Plans to redevelop Bristol's Memorial Stadium into an 18,500 all-seater venue have hit a hurdle. 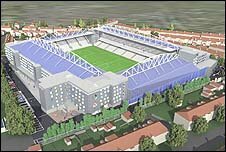 Bristol Rovers had planned to part-fund the redevelopment by incorporating student accommodation into the scheme. But the club's preferred company to build the flats has pulled out, leaving the club having to search for an alternative provider. A statement on the club website said negotiations were under way and an announcement would be made next week. Meanwhile, a supporters' club trip to Cheltenham's Whaddon Road, which Rovers plan to share during building work, has been called off. Bristol Rugby Club's planned groundshare with Newport at Rodney Parade could also be affected.